HAGERSTOWN, Md. 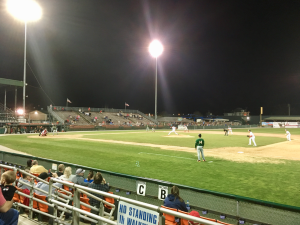 — Josiah Spradlin did not arrive to Municipal Stadium until the top of the fifth inning to watch the game between the host Hagerstown Suns and the visiting Greensboro Grasshoppers. It was just in the nick of time. 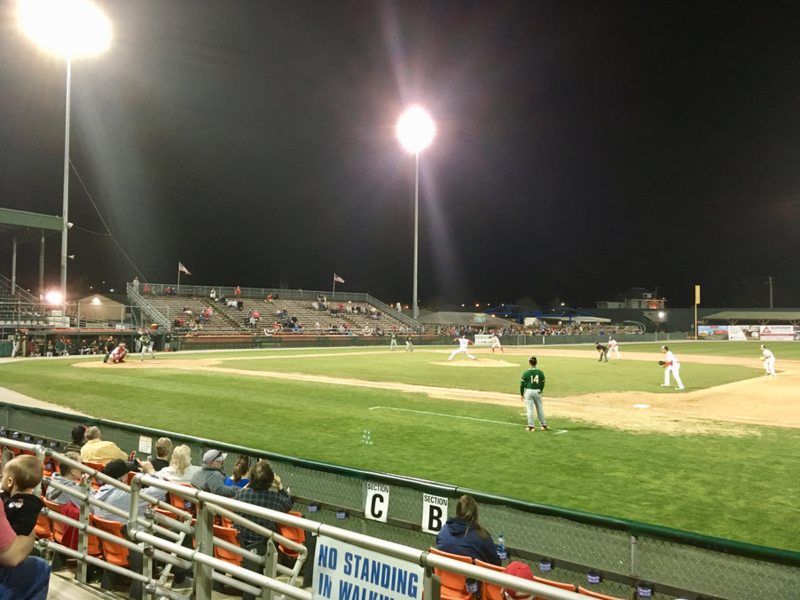 The Greensboro Grasshoppers earned a 10-9 win in 10 innings on Thursday night against the Hagerstown (Md.) Suns at Municipal Stadium. The 8-year-old Appalachian Little League third baseman’s presence — packaged with timely hits and defensive gems by the Hoppers themselves — propelled Greensboro to a 10-9 win in 10 innings. It was the first extra-inning gram for the Hoppers this season. Beginning this season, Minor League Baseball teams start with a runner on second base in every half inning after nine frames. The Hoppers utilized the new rule to perfection. The Suns did not. Greensboro battled back from deficits of 5-0, 7-3 and 9-5 en route to victory, which ended on a double play when pitcher Manuel Rodriguez caught a liner from Suns hitter Nick Banks, then turned and tossed to second to pick off the runner and end the game. Earlier that inning, Cole Freeman — who started the bottom of the 10th on second base — was tagged out on a fielder’s choice when Rodriguez, a lefty, fielded a ground ball and chose wisely for the lead runner at third. It was a risk, but the reward was huge. With the win, Greensboro moved to 4-3 on the season, one game after suffering the team’s first shutout loss of the season. Aaron Knapp doubled home Michael Hernandez in the top of the 10th inning. Hernandez began the inning as a runner on second base under Minor League Baseball’s new rules designed to improve pace of play. In the top of the 10th, Hagerstown turned to reliever Max Engelbrekt, who allowed a sacrifice bunt to Zach Sullivan, moving Hernandez to third. Sam Castro grounded out against a drawn-in infield, setting up Knapp’s two-out double to bring in the go-ahead run, giving the Grasshoppers their first lead of the game. Reilly Hovis (1-0) earned the win with 2.0 scoreless relief innings, and Rodriguez earned the save (1) while Hagerstown’s Engelbrekt (0-1) took the loss, allowing an unearned run in the 10th. Greensboro (4-3) trailed 5-0 after two innings before slowly chipping away at Hagerstown’s lead. In the third inning, Sullivan put the Hoppers on the board on an Isael Soto sac-fly. One inning later, Sullivan’s 2-run home run (1) pulled the Grasshoppers within two, 5-3. The Suns extended their lead to 7-3 thanks to Banks’ 2-run blast in the home half of the fourth. Hagerstown led 9-6 through seven innings, but Greensboro closed the gap thanks to a run in the eighth and two more in the ninth to force extra innings. The Grasshoppers pounded out 13 hits on the night as Knapp, Soto, Eric Gutierrez, Micah Brown, and Sullivan all enjoyed two-hit performances with both Sullivan and Brown notching their first home runs of the 2018 campaign. Brown thanked Spradlin, the visiting 8-year-old, for his assistance by giving him an official South Atlantic League baseball as the players exited the field down the first base line towards the clubhouse. Spradlin, of course, was ecstatic — it was his first game ball. Hagerstown’s Luis Garcia pounded out four hits in a losing effort, while three different Suns — Banks, Kameron Esthay, and Alejandro Flores — homered on the night. The Grasshoppers continue this four-game series against the Suns on Friday at 7:05 p.m. at Municipal Stadium. Greensboro is back at First National Bank Field on Thursday, April 19, to open a 4-game home stand against the Charleston RiverDogs. Tickets are available online at gsohoppers.com.